An exciting aspect of Torah study is the application of the age-old principles of halachah to the modern world in which we live. Thus, as an example, there is obviously no Talmudic discussion about the propriety of walking past a motion detector on Shabbat, yet contemporary posekim (halachic decisors) have analyzed this issue and found relevant source material in the vast sea of halachic literature. By identifying fundamental principles and concepts, halachists have addressed she’eilot (questions) that run the full gamut of modern human experience. A fascinating case in point is the issue of purchasing chametz (fermented wheat, spelt, oat, rye and barley) after Pesach in a Jewish-owned supermarket. There were no ShopRites in fourth-century Babylonia when the Talmud was redacted, but, nonetheless, treatment of this matter touches on numerous areas of halachic thought. One could easily compose an entire volume on this topic alone. This article will but scratch the surface and present some of the broad issues of concern. Q. What is “chametz sheavar alav haPesach”? A. The Torah prohibitions against chametz are unique, in that a Jew is not only prohibited from consuming and deriving benefit from chametz during Pesach, but he is even restricted in owning it because of the injunction of “ba’al yairo’eh uba’al yimotze” (literally, chametz “may not be seen or found,” but the Sages interpreted this to mean that ownership of chametz is prohibited). In addition, the rabbis of the Talmud established an after-the-fact penalty for owning chametz products during Pesach, in violation of halachah. Such items, known as “chametz sheavar alav haPesach,” may not be consumed, nor may one derive benefit from them. This means that if you neglected to sell your box of Raisin Bran before Pesach, you may not consume it or derive benefit from it even after Pesach. (In fact, if one accidentally purchased chametz sheavar alav haPesach, the item may not be returned for a refund, as this would constitute derivation of benefit.) While some posit that only the owner is penalized for chametz sheavar alav haPesach, in practice we follow the viewpoint that its restrictions are universal and apply to everyone. (Perhaps this serves as a deterrent against hoarding chametz in order to sell it after Pesach.) As a result, one may not purchase chametz from a Jewish-owned store or supermarket after Pesach if the owner continued to own and purchase chametz during the holiday. Q. What if the store is jointly owned by a Jew and non-Jew? What is the status of the chametz in this instance? A. There is an opinion that if the non-Jewish partner owns a majority of the business, there is no concern of chametz sheavar alav haPesach (Shu”t Zecher Yitzchak, responsa 8). Nonetheless, Rabbi Moshe Feinstein (1895-1986; Iggerot Moshe, EH 1:7) adds one important caveat: If the Jewish partner is the manager of the company, the enterprise is treated as a Jewish business, even though the partner owns less than 50 percent of the company. Q. How do I know which stores are Jewish owned and do not sell their chametz? I may know who owns the small local grocery store around the corner, but how would I know if the owner or manager of a large chain is Jewish? True, I can search the Internet and perhaps discover the owner’s name, but how would I know if he is really Jewish? Even if the owner has a Jewish-sounding name, there is no guarantee that he is Jewish. It is an unfortunate reality today that his mother may have been non-Jewish, which renders him halachically not Jewish. A. There are private lists available that circulate around Pesach time with basic information, but it is best to check with your local rabbi. If he is in doubt, he can call the Orthodox Union (OU) or another major kashrut organization that has access to this information. Q. What items are included in this prohibition? A. Bread, cookies, cake, pretzels, blintzes, cereals and other foods that contain any of the five primary grains (oat, wheat, spelt, rye and barley) are included. Interestingly, even flour is problematic because wheat is tempered in water before milling, and flour has the status of chametz. Whiskey, beer and other alcoholic beverages distilled from grain also pose the same concern. Q. Does chametz sheavar alav haPesach apply to kitniyot? A. Jews of Ashkenazic descent refrain from eating kitniyot (legumes, such as corn, rice, beans, et cetera) during Pesach. However, this is a tradition that evolved in the last millennium, and these foods are not actual chametz. As such, chametz sheavar alav haPesach does not apply to kitniyot, and these items may be purchased in any supermarket after Pesach. Q. Do products that contain vinegar (such as salad dressing, pickles and ketchup) fall under the prohibition of chametz sheavar alav haPesach? A. Surprisingly, the answer is the classical rabbinic response: “It depends.” Vinegar is manufactured from fermented alcohol, and there are various sources of alcohol. In the United States, most vinegar and alcohol is corn-derived (corn is kitniyot), and chametz sheavar alav haPesach does not apply. In contrast, in Europe, the majority of alcohol is derived from barley. As such, vinegar-based products in Europe are a problem. Q. How long must one wait before buying chametz from a Jewish-owned supermarket after Pesach? A. When I was a child, it was customary to wait until Shavuot, which is six weeks after the conclusion of Pesach. This date was a “guesstimate” of how long it would take for the stock of chametz that had been in the store during Pesach to be depleted. 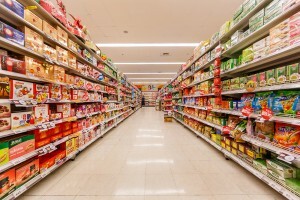 Today, it is generally assumed that the inventory in a major supermarket is sold much more quickly; shelves are generally restocked on a daily basis. Still, supermarket chains maintain large inventories of products in warehouses for distribution in individual stores, and it is necessary to calculate the turn-around time from the warehouse delivery until the purchase by the customer in the actual store. Rav Moshe writes (Iggerot Moshe, OC 4:96) that it is permissible to purchase chametz from a supermarket at the point in time when there is a 50 percent possibility that the supermarket purchased the chametz after Pesach. Since chametz sheavar alav haPesach is a rabbinic (and not a Biblical) injunction, one can rely on a principle known as “safek derabbanan lekula” (one can be lenient when it is uncertain if a rabbinic restriction applies), and therefore shop freely in the store. The question is, When can one legitimately say there is a 50 percent chance that the chametz on the supermarket shelf was purchased by the store after the conclusion of Pesach? How long does it take to establish a reasonable doubt? It is difficult to give a precise cut-off date. Communal rabbis generally tell their congregants when they feel comfortable purchasing chametz, and my impression is that Lag B’Omer (which is twenty-five days after the conclusion of Pesach) is a safe time. Q. Why can’t rabbis sell the chametz of Jewish-owned supermarkets before Pesach? Most of us, via our rabbis, sell our chametz to a non-Jew (in a process known as “mechirat chametz”) to avoid the prohibition of owning chametz during the holiday. Since we do not legally own the chametz during Pesach, it can be consumed afterwards, when the rabbi purchases the chametz back. Why not do the same on a grand scale for supermarkets as well? We could then safely purchase chametz from the store as soon as yom tov concludes. A. Indeed, this is exactly what takes place. In fact, some rabbis arrange to sell not only individual stores but also entire supermarket chains. However, this process is not without controversy, as it appears on the surface to be nothing more than a subterfuge. After all, some supermarkets are open on Pesach, conducting business as usual, buying and selling chametz. Doesn’t this demonstrate that the sale of chametz is performed without sincerity? This argument is not new. Rabbi Chaim Chizkiyahu Medini (1832-1904) writes in his encyclopedic work, the Sdei Chemed, that a storeowner in his city closed his shop for Pesach and arranged for the sale of his chametz to a non-Jew. During Chol Hamoed, it was discovered that the store was secretly engaged in selling the chametz to non-Jewish customers. Rabbi Medini viewed this as a clear indication that the storeowner was not serious about the original sale. He publically forbade the community to purchase chametz from this store (as he considered it chametz sheavar alav haPesach), even though it resulted in enormous losses for the storeowner. Q. Why is mechirat chametz an accepted practice when it appears to be no more than a legal charade? A. The arguments cited above against selling supermarkets to non-Jews for Pesach lead us to fundamental questions about the propriety of the general sale of chametz as well. To highlight this point, consider the following: For the past twenty years, I have had the unique honor of arranging the sale of chametz for all Jewish-owned companies that are certified by the OU. It has often occurred to me that the total value of this chametz amounts to hundreds of millions of dollars. Every year I meet with an accommodating non-Jew who graciously purchases this chametz for a down payment of ten dollars. I explain to him that the balance of payment is not due until after Pesach. If one year I decide to not repurchase the chametz, this kind-hearted purchaser would have to come up with an astronomical sum that would be way beyond his means. Most rabbis don’t engage in million-dollar sales, but the chametz they sell on behalf of their congregants may easily be worth tens of thousands of dollars. How can these sales be valid when the buyers lack the financial resources to pay for the goods? This very same argument was made almost three hundred years ago by Rabbi Alexander Sender Schor (1650-1733) (Bichor Shor, Pesachim 21a). The sale of large quantities of chametz became prevalent a few hundred years ago as Jews began to invest heavily in the liquor industry, and the disposal of chametz before Pesach would have resulted in very substantial losses. Rabbi Schor asks, “How can the sale be valid when the purchaser is a man of very limited means who never purchased anything of significant value in his lifetime?” Though Rabbi Schor offers a halachic response to this question, many rabbanim objected to mechirat chametz on these grounds, and the matter remained controversial. In fact, many people do not sell chametz be’ain (visible chametz), and will only rely on mechirat chametz for mixtures of chametz. (For example, licorice and many corn-based cereals contain wheat flour as a minor ingredient. The halachah is less strict with regard to such chametz, since it is not “visible.”) A full analysis of this topic is beyond the scope of this article, but the lenient position has generally prevailed. Mechirat chametz has become a fixture of Jewish life, and most people sell all kinds of chametz. For our purposes, suffice it to say that mechirat chametz is valid because the sellers, who are unable to own chametz, clearly want to unburden themselves of these forbidden wares, and the purchaser is told that the sale is legally binding. In theory, the buyer could acquire the necessary capital to pay the balance due after Pesach by selling the chametz that he has acquired. Q. Why is mechirat chametz for a supermarket that continues to sell chametz during Pesach a valid sale? A. Good question. Many posekim fundamentally oppose the sale of Jewish-owned businesses that sell chametz on Pesach. In stark contrast to the mechirat chametz of a halachically observant Jew, the sale of a supermarket that is fully open for business on Pesach lacks the aura of respectability. The seller is clearly not sincere about the sale. For this reason, Rabbi Joseph B. Soloveitchik (1903-1993) and others considered sales involving supermarkets that sell chametz to customers on Pesach to have no validity. Nonetheless, Rav Moshe (Iggerot Moshe, OC 1:149, 2:91 and 4:95) was the champion of this transaction. He put forward various arguments of justification, one of which is that halachah does not take into consideration private thoughts (devarim shebelev) that are not verifiable. Furthermore, it is conceivable that the storeowner prefers to transfer ownership of his chametz to a non-Jew so his religious customers can shop freely in his establishment after Pesach, even though he intends to continue selling chametz merchandise during Pesach. The OU follows the more stringent position of Rabbi Soloveitchik. Q. How does the OU certify Jewish-owned businesses that manufacture chametz? How are manufacturers different than supermarkets? A. OU companies that are Jewish owned are not permitted to manufacture or distribute chametz during Pesach. When the OU enters into a new contract with a Jewish company, we make this policy clear at the outset. Very well then. You will rely on Rav Moshe. You will check with your rabbi and identify a supermarket that has sold its chametz. Immediately after Pesach, you will rush out and buy fresh Danishes to enjoy with your coffee after an entire week of cake-deprivation and eating cookies made from potato starch. Not so fast! Not all the problems have been resolved. Q. Isn’t there a problem concerning chametz purchased by the supermarkets during Pesach itself? According to halachah, one cannot sell davar shelo ba le’olam (goods which are not currently in one’s possession), even if the transaction will not take effect until such time that one acquires the materials. It follows then that a rabbi can only sell the chametz owned by a supermarket before Pesach to a non-Jew, but cannot do so for the chametz that is acquired during Pesach. Once Pesach is over and you are grocery shopping, it is likely that much of the chametz you see on the shelves had been purchased by the supermarket on Pesach. Seems like the dream of fresh Danish and coffee has just gone up in smoke. Some rabbanim have found creative ways to deal with the problem of chametz purchased by supermarkets during Pesach, but these solutions have not been universally accepted. This subject is complex and is beyond the scope of this article. Q. Now I am really confused. If Rav Moshe maintained that supermarkets cannot sell chametz that is acquired during Pesach, why did he advocate the sale of supermarkets before Pesach? A. For two reasons. First, the sale of a supermarket is halachically beneficial for the storeowners. By transferring ownership of large quantities of chametz that are on the supermarket shelves before Pesach, the owners are spared from violating multiple Torah restrictions. Second, the sale limits the status of chametz sheavar alav haPesach to the narrow window of chametz that is purchased by the store on Pesach, and thus, the turnaround time for the depletion of prohibited merchandise is shortened. Q. Some of the supermarket superchains on the East Coast were founded by Jews during the last few decades of the twentieth century. Is it true that in the past few years, many of these chains have been sold to non-Jewish investors? A. Yes, it is true. In fact, when this happened, many rabbis gave a sigh of relief, as we thought that matters had been simplified—and one could buy chametz after Pesach in all those supermarkets. But not so! Shortly thereafter we learned that the largest distributor of food items on the East Coast, which distributes products to a number of major supermarket chains, is the Jewish-owned C&S (Cohen & Siegel). If the distributor owns chametz during Pesach, the very same problems of chametz sheavar alav haPesach apply equally to all non-Jewish-owned stores supplied by that company. Rabbi Elazar Mayer Teitz of Elizabeth, New Jersey, sells the chametz of C&S, but the concern discussed above with respect to supermarkets (the inability of the rabbi to sell chametz that is acquired on Pesach) has now shifted to the distributor, and the problems remain the same. Some rabbis are of the opinion that one can purchase chametz after Pesach in non-Jewish supermarkets that are supplied by C&S. The logic goes as follows: Whatever chametz was in the possession of C&S before Pesach is not problematic, since it is sold to a non-Jew before Pesach begins. Chametz purchased by C&S after Pesach is obviously acceptable for use. Only chametz acquired during Pesach is therefore a matter of concern. No one is certain how long it takes for products to move from the C&S warehouse to the supermarket shelf. Let’s say you visit your local supermarket (which uses C&S as a supplier) the week after Pesach and you see a box of Cheerios on the shelf. There is no way to determine if that box is chametz sheavar alav haPesach. The same uncertainty prevails if you shop two or three weeks later. Since we are dealing with chametz sheavar alav haPesach, which is a rabbinic injunction, the rule of “safek derabbanan lekula” applies and one can be lenient and purchase the Cheerios. Other rabbanim are not comfortable with this approach. We know with certainty that at some point in time, most of the chametz in the store will be chametz sheavar alav haPesach. Because of our lack of information, we can’t establish precisely when that is. It is unreasonable to allow the purchase of chametz at all times when we know that, at some instance, the chametz is prohibited. I have discussed this topic with Rabbi Yisroel Belsky, halachic consultant to the OU, on many occasions, and he firmly subscribes to the latter view. Q. Why is everything left unresolved? Everything seems to be a matter of dispute and is left hanging. Why is there no bottom line? Tell me the names of the stores where I cannot shop after Pesach and give me a firm cut-off date, and that will be that. Why is the OU not sharing this information? A. Halachah is not monolithic and rabbinic disputes abound. Jews have always turned to their rabbis for guidance and assistance when there are conflicting halachic opinions. For the reasons outlined above, there is no one definitive position for where and when chametz can and cannot be purchased after Pesach. It is difficult to gather precise information and it is no simple matter to chart a course between conflicting halachic positions. The OU does not supervise supermarkets, and it is our belief that questions related to chametz sheavar alav haPesach fall into the domain of she’eilot one should ask of his local rabbi. Hopefully, you now have a greater appreciation for the complexity of issues that are relevant in rendering a halachic decision on these matters. Q. Can you summarize the discussion? • The sale of chametz in Jewish-owned stores that operate fully on Pesach (i.e., chametz is sold in the store) is a matter of dispute. • Even for those who assume the sale is valid, it is questionable whether the sale is effective for chametz that is acquired during Pesach. • Ask your rabbi to determine which supermarkets are Jewish owned or are supplied by Jewish distributors, and how long after Pesach you must wait to purchase chametz sold in these stores. Q. How about a nice simple closing thought? A. I once learned a great lesson. I accidentally drove into an exit lane and was forced to leave the highway prematurely. This put me on a new road, which did not have an exit for over forty miles. It took me more than an hour to turn around and get back on the original highway. The lesson here is that one wrong turn in life can have long-term consequences. Perhaps chametz sheavar alav haPesach teaches the same idea. If one does not handle chametz properly before Pesach, the prohibition against eating chametz will linger long after Pesach is over. Dealing with chametz sheavar alav haPesach in our modern world is not a simple matter. This rabbinic injunction underscores the importance of doing things correctly up front so that we are not haunted by complications in the future. Rabbi Luban is an Executive Rabbinic Coordinator for OU Kosher and has been serving as Rabbi of Congregation Ohr Torah in Edison, New Jersey since 1983.